The Church of the Second Advent has designated sacred places for divine worship and the performance of the liturgy. These sacred places are devoted to God and divine worship, specifically for use by the faithful for religious and liturgical functions. The law of the Church maintains that all sacred places have an existence of their own since they are reserved for religious worship and holy use in accordance with the liturgy and sacred calendar. Sacred places consist of abodes, sanctuaries, consolatories, basilicas, churches, shrines, oratories, chapels, and other such places set aside for devotion to God and made blessed by an act of consecration, dedication, or blessing, as prescribed by canon law. A Consecrated Sanctuary is a sacred place made so by its association with the Divine Presence. Sacred sanctuaries of the Church are distinguished from other places. They provide grounds for the performance of sacred liturgy, for the reading of sacred scripture, and for the inviolability of public and private worship. 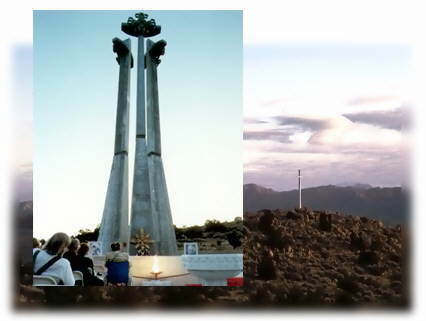 The 1200-acre Red Rock Consecrated Sanctuary, Retreat & Wildlife Park is located in Antelope Valley north of Reno and provides protection and security for the Order to assure that worship may take place without disturbance or interruption. Twenty-five open-air churches have been constructed on the grounds of the vast Red Rock Sanctuary, Shrines, oratories, and gardens also dot the landscape. Some churches - like New Epiphany, New Pentecost, and the Cathedral Church of the Americas with its ninety-foot triune cross spire - are situated majestically atop mountains and hills. Others -- like the 36-acre Church of the Christian Churches -- occupy level plains. Development of the Sanctuary is ongoing. The Cathedral Church of the Americas, with a capacity for 1000 congregants and a park of 400 newly-planted trees, is only a part of the grand design planned for the Monument to Human Spiritual Rights, of which the Cathedral is a part. There are also plans presently in progress to construct a chapel as well as a refectory, a comfortable meeting place for congregants to gather before and after services and during convocations. In the future, the Sanctuary will serve as the campus of a 40,000-square-foot university complex as well as the 10,000-square-foot Abbey of Monte Viejo. 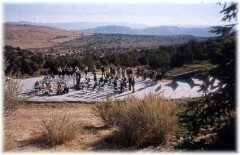 Three wells provide water throughout the Sanctuary of Prophecy, the portion of the Sanctuary to the south of Antelope Valley. The highest wellhead is set atop the Temple Mount. From a depth of nearly 1300 feet, through clear white limestone, it will feed the future Shrine of God's Waters. A second well provides water for the irrigation of groves and gardens in addition to all the building facilities. A third well provides another source for irrigation and feeds fresh groundwater into a valley reservoir with a three-quarter million gallon capacity. The Church has entered into agreements with the Truckee Meadows Fire Protection District and the federal Bureau of Land Management to provide water from this reservoir to residents of neighboring valleys in the event of fire emergency. The Red Rock Sanctuary, consecrated to the worship of God, also provides a retreat for members of the Jamilian Order and a sanctuary for wildlife native to the high desert and the Sierra Nevada. In a plan developed with the Nevada Divisions of Forestry and Wildlife and with the U.S. Department of Agriculture, the Church's Sanctuary will protect and enhance the wildlife in the area through planned provision of food and shelter. The Order will plant native food stocks, the reservoir and other watering holes will provide water, and the entirely-fenced Sanctuary grounds will provide protection for deer, antelope, and birds.